Created and performed by Tess Sullivan, Ariaana Osborne and Liv Parker, Before Karma Gets Us is like The Prestige if it was re-imagined by the Three Stooges. Built on a simple mise-en-scene (red curtains, a table, a podium and a contraption called ‘The Broken Woman’, Before Karma Gets Us manages to get a lot of mileage out of limited resources. Pitched as an old-school carnival magic show, the show features a series of vignettes featuring the performers in ever-shifting roles (including a clever recreation of a newsreel featuring the newly crowned Queen Liz (Sullivan)) that are enjoyable on their own; the focus on three egos competing for dominance is a rich comic vein that keeps the show on track. There are plenty of set pieces that show off the performer’s impressive skills, but the nuanced portrayals of the three characters and the interactions gives the show a sense of tension and personality. One of the funniest moments in the show is when Sullivan pretends to double-check the tape on the stage where the cast have to hit their marks and moves her mark toward the audience so she is in front of her co-stars. It is such a petty little moment – her mark is in the centre of the others so she would already draw most of the attention anyway. As the egotistical leader of the act, Sullivan is great. Undermining the character’s mystical ‘straight man’ routine with occasional flashes of insecurity, she creates a terrific anti-villain without ever declaring her intentions. Sullivan’s character’s fear of losing the spotlight matches Ariaana Osborne’s desire to be in it. Osborne plays the more savvy of Sullivan’s apprentices, and her never-ending struggle with Sullivan is the comic heartbeat of the show. As the third member of the group, Liv Parker is a delight – an ignoramus whose body becomes the literal battleground between Sullivan and Osborne. 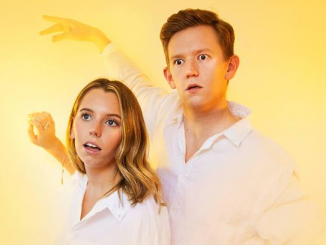 An interesting showcase for three emerging performers, Before Karma Gets Us proves that in order to make something very silly you have to be very smart. Before Karma Gets Us plays at Basement Theatre until 6 April.